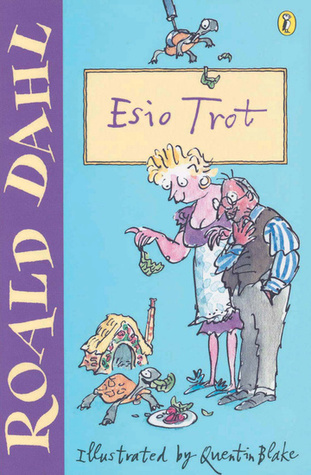 More of a short story than a novel, Esio Trot by beloved children’s book author Roald Dahl is sure to leave you with a smile on your face. Mr. Hoppy, a retiree, is in love with the woman below his balcony, Mrs. Silver. Mrs. Silver is in love with her tortoise (Esio Trot spelled backwards.) Mr. Hoppy has to find a way to ingratiate himself into Mrs. Silver’s heart by replacing the tortoise named Alfie. One day, Mrs. Silver is complaining to Mr. Hoppy about how she wishes her tortoise would grow. Mr. Hoppy hatches a plan to make Alfie grow, thereby winning over Mrs. Silver. His plan is to tell her to whisper to the tortoise three times a day a ridiculous, backwards sayings. Mr. Hoppy goes out and purchases 100 tortoises with markings similar to Alfie’s and slowly replacing Alfie by stealing him off her balcony. Every couple of weeks while Mrs. Silver is out at her part-time job, Mr. Hoppy replaces Alfie. Sure enough, Alfie “grows.” Mrs. Silver is forever grateful, and Mr. Hoppy finally has the courage to ask Mrs. Silver for her hand in marriage and she agrees. This book is literally a 20-25 minute read with pictures on every page. Fun story. The only thing I didn’t like is Mrs. Silver never finds out about the trick and the original Alfie finds a new, loving home. Overall, delightful to read and recommended.